Franklin County (Pa.) - Willoughby saw an advertisement in the New York Tribune and would like more information about investing money in Kansas lands. 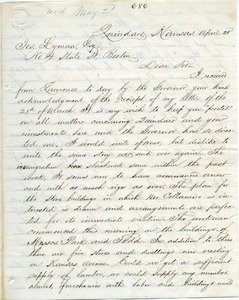 Part of the Kansas Land Trust correspondence. Clifford (Pa. : Township) - West would like information about emigrating to Kansas. 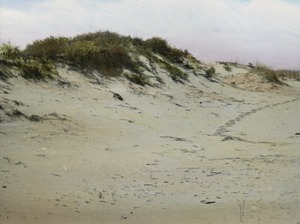 Part of the Kansas Land Trust correspondence. Bridgeton (N.J.) - Conlin saw a notice in the New York Tribune. 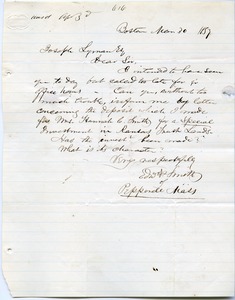 He is interested in settling in Kansas near Lawrence and would like information regarding price and the terms of payment. 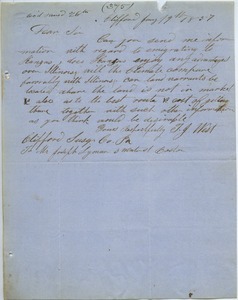 Part of the Kansas Land Trust correspondence. Pepperell (Mass.) 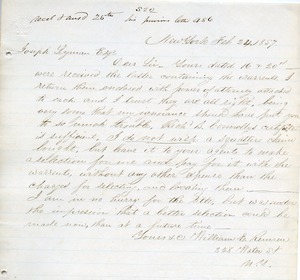 - Making a deposit for investment into Kansas Land Trust for Hannah C. Smith. Part of the Kansas Land Trust correspondence. 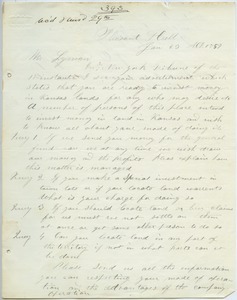 Providence (R.I.) - Ball would like to purchase lands in Kansas if it is a safe investment and helps Kansas be free. He has questions about the organization and if they will be employing an agent for the sales. Part of the Kansas Land Trust correspondence. Kansas - Mentions return of warrants, sufficiency of Richard B. Connolly's certificate, and decision not to buy a squatter's claim, but to leave decision up to agents. Part of the Kansas Land Trust correspondence. 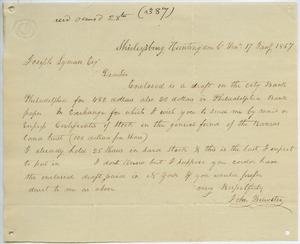 Shirleysburg (Pa.) - Brewster sends 500 dollars to purchase more shares in the trust. Part of the Kansas Land Trust correspondence. 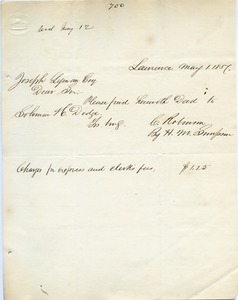 Lawrence (Kan.) - Notes deed addressed to Solomon H. Dodge. 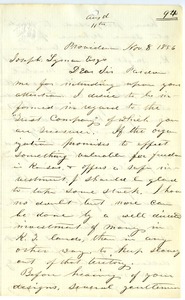 Part of the Kansas Land Trust correspondence. Quindaro (Kansas City, Kan.) - Describes immigration to Quindaro (Kansas City, Kan.), construction, and operations in town, and opposition to settlement by Leavenworth, Kansas and Western Railway. 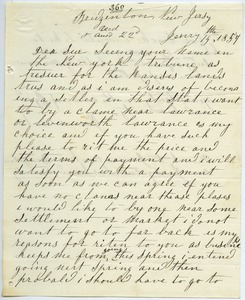 Part of the Kansas Land Trust correspondence.